Upgrade Your Order Today to the Ultimate Sleep Apnea Treatments Power Pack for Just 2 Payments of $47 And Get the Sleep Apnea Lifestyle Bundle Absolutely FREE! No thanks, Marc. I understand once I leave this page I'll never have this opportunity again - and won't be able to do this later. I'll never have the chance to upgrade to the Ultimate Sleep Apnea Treatments Power Pack and get the Sleep Apnea Lifestyle Bundle for free. By clicking on this link I waive my right to this special offer forever. The Sleep Apnea Exercise Program is a complete program of exercises for your mouth, throat, tongue, and jaw. Acupuncture as an alternative medicine goes back thousands of years. Among other ailments, acupuncture is used to reduce sleep apnea too. Quick: which herbs that can greatly reduce sleep apnea symptoms and reduce insomnia? The Program also includes an informative interview with master herbalist Steven Frank, who explains his unique perspective on the cause of obstructive sleep apnea, and what he did to tackle his own OSA. The Buteyko Breathing Technique was developed by Ukrainian doctor Konstantin Buteyko in the 1950s and has been used since to tackle asthma and a host of other conditions. But there is hope! In this report I share with you techniques for overcoming the stress, anxiety, and panic that sometimes accompanies sleep apnea and using CPAP equipment. 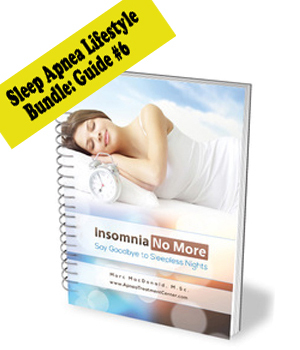 This no-fluff, 121-pages guide explains how to diagnose the cause of your sleep apnea. Insomnia affects a staggering number of people across the world. YES! I WANT to Upgrade to GET Access to the Ultimate Sleep Apnea Treatments Power PackToday! Yes! 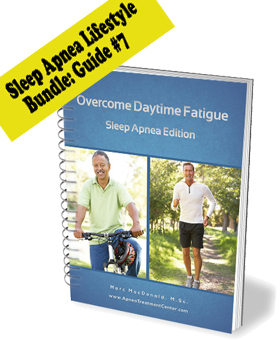 I can’t wait to get my hands on the Ultimate Sleep Apnea Treatments Power Pack – and the Sleep Apnea Lifestyle Bundle (5 Guides) Absolutely FREE!I understand that I have a one-time opportunity today to upgrade my order for just one payment of $47 today - and one more payment of $47 in 30 days. I also understand I can update my order today 100% risk-free because I’m completely protected by your 60-Day 100% Money-Back Guarantee. Meaning, if the Ultimate Sleep Apnea Treatments Power Pack isn’t everything you’ve promised (and more) I can return the Power Pack for a fast and courteous refund, no questions asked and no hassles either. To upgrade your order to the Ultimate Sleep Apnea Treatments Power Pack , simply scroll down and click the big yellow button now – and you’ll get access to everything above (PLUS several additional “unadvertised” free bonuses) minutes from this very moment. IMPORTANT: This chance to UPGRADE your order to the Ultimate Sleep Apnea Treatments Power Pack of just TWO payments of $47 - is a one-time opportunity, good today only. To take advantage of this opportunity simply click on the big orange button below now - and you'll get access to theUltimate Sleep Apnea Treatments Power Pack minutes from this very moment! Terms and Conditions: You expressly agree that use of this site and this product and all other products and services of Sleep Media, Inc. is at your sole risk. You expressly agree that Sleep Media, Inc. shall in no event be held liable to any party for any direct, indirect, punitive, special, incidental or other consequential damages arising directly or indirectly from any use of this material, which is provided "as is," and without warranties. ---- PAYMENT ----- I understand that billing for this product is recurring. I will be billed $47 immediately, then an additional $47 in 30 days. By clicking accept, I agree to the payment terms of this recurring product. ---- REFUND POLICY ----- I understand that I have 60 days from the date of purchase to request a refund. I can request a guaranteed refund for ANY reason within 60 days. After 60 days, refunds MAY be granted at the sole discretion of Sleep Media, Inc.. ---USE AND DISTRIBUTION OF COURSE CONTENT----- I understand that I may download the course contents to my personal video display devices such as an iPad, iPod, mobile phone, etc, for my own personal use. I understand that when I purchase the The Ultimate Sleep Apnea Treatments Power Pack I am purchasing the right to consume the the course content (a "license"), and that I do not own the content itself - and thus I am not free to distribute it in any way. I agree that I will not make the Power Pack contents available to individuals who have not purchased The Ultimate Sleep Apnea Treatments Power Pack program. This includes activities such as uploading the Course content to a video-sharing site like YouTube, making available a torrent of the Course, or uploading a publicly-available container file of the Course to any file-sharing site such as RapidShare, MegaUpload, Mega, etc. I understand that the course materials are Copyrighted by Sleep Media, Inc., and that any public distribution of the materials I engage in constitutes a violation of Sleep Media, Inc. copyright, and is thus illegal. NOTE - As a "good-faith" exception to the above rule: If you would like to share the contents of The Ultimate Sleep Apnea Treatments Power Pack with a close friend or family member, you have our permission to do so. But this should not be construed to mean that you have the right to share your login information with the general public. Our software will automatically shut down your account if we detect too many different people trying to log into the same account. The point of this course is to help you, and the people close to you, conquer your sleep apnea. Please use discretion and don't take advantage of Sleep Media, Inc.’s efforts in this regard. © Sleep Media, Inc.